Find out more on (020) 8877 1200 or at www.carerswandsworth.org.uk. 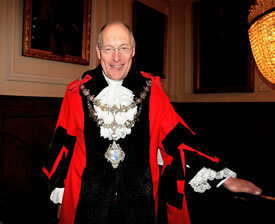 The annual mayor-making ceremony took place on May 19th at the Civic Suite on Wandsworth High Street. Cllr McCausland is a consultant building surveyor and has worked in the construction/developer industry for his entire working life. He was born in Northern Ireland, he attended Ampleforth College, York before completing his education at Trinity College, Dublin. He and his wife Elizabeth have three grown up sons and four grandchildren. Cllr McCausland first moved to Wandsworth in 1980 and joined the Conservative Party in 1996. Two years later he was elected to the council representing the former St John Ward. After the ward boundaries were redrawn he stood successfully in Fairfield Ward in 2002, 2006 and 2010. During his career at the council he has served on a number of committees including Housing, Social Services and Licensing. His main focus has been planning and he has previously held the post of Deputy Chairman of the Planning Applications Committee. Away from the town hall Cllr McCausland spend many years as a Trustee of the St Joseph Society, a sheltered housing scheme. He is also a Governor of Allfathing Primary School and a Trustee of the Ethiopia Permaculture Foundation – a charity promoting the sustainable stewardship of Ethiopia’s ecological resources. In his spare time Cllr McCausland enjoys walking, frequent visits to his hometown of Ulster, as well as holidaying with his family in the south west of Ireland. He is a keen environmentalist with a particular interest in conservation. His mayoral charity for the year will be the Battersea Summer Scheme, which provides trips, outings and opportunities for under-privileged young people from Battersea and Balham. The new Deputy Mayor Jenny Nickels is a Conservative councillor representing the newly formed Roehampton and Putney Heath Ward. Cllr Nickels has lived in Wandsworth since 1985 with her partner of 20 years, Graham Lovelock. She has previously owned her own local business and is currently employed as a Business Centre Manager promoting SME’s in the local community. She was first elected to the council in 1990, representing the Southfields Ward. Her past committee appointments include the Environment and Leisure OSC, Health OSC as well as the Audit, and Standards Committees.